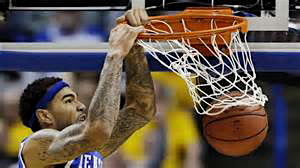 Willie Cauley-Stein puts down two with emphasis. Now we are getting down to brass tax. After responding with a 78-39 pasting of West Virginia, the undefeated No.1 ranked and No. 1 overall seeded Kentucky Wildcats will play the three-seeded Irish of Notre Dame today at 8:49 PM EST in Cleveland. This has been a long season, filled with growing anticipation as each win has piled on top of another. 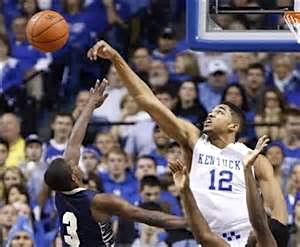 It began back on Nov. 14, when UK cruised to a victory over Grand Canyon 85-45. There were near misses in overtime to Mississippi and Texas A&M, and a ball was in the air down in Baton Rouge that could have brought a loss, but it didn’t happen. Dates got circled on the calendar as prognosticators theorized scenarios where Kentucky might find a way to lose. At Florida, at Georgia, the Arkansas Razorbacks are ranked and coming to Rupp. It didn’t matter, this talented and ginormous bunch of kids kicked the snot out of every one of those teams. Poor Florida had to take a beating three times. Consider that payback for last year Gator-fans. Kentucky ran the table on an undefeated regular season. That is unheard of in a power conference, especially with all the parity in college basketball today. Then the theory kept getting floated about how the Cats maybe should drop one in the SEC tournament. This supposedly would help the team refocus and remove some of the pressure from this young team’s shoulders before entering the NCAA tournament. These UK kids had no interest in losing. They looked insulted to be out on a court with teams from the SEC again. Arkansas gave it a go for a second time, but the Cats secured the tournament championship with ease. Come tall or Karl-Anthony Towns will send your shot back. Going into the Big Dance I didn’t think Kentucky would get a game until the Elite Eight. Once the seeds were released that became apparent, even with West Virginia looming as a possible Sweet Sixteen matchup. You have to respect Bob Huggins and his crew. They found a way to upset the 2010 Cats, who were littered with NBA talent. But this ain’t 2010. I watched West Virginia beat Maryland, and it was a haphazard affair. I saw their vaunted press in action, but this is simple math. Check the rosters for UK and WV, and the size of the players. Game over. A buddy of mine asked me a couple hours before the tip how I felt the game would go. I had no nerves and said I was 100 percent sure Kentucky would win and it wouldn’t even be close. It was worse than that. At the 14:14 mark the Cats had jumped on West Virginia 12-2. It was over. You could see it on the faces of the West Virginia players. The Mountaineers could get their move to the basket but because of the height advantage they had to take an awkward angle to the hoop. Extra effort was required and additional loft had to be placed on all shots to get them over Kentucky, which increased the difficulty level of everything West Virginia attempted. The announcing crew picked up on this quick. Len Elmore: Well I said the first 10 minutes would tell the tale, right now the first five minutes for West Virginia have been a nightmare. Chris Webber: Just looking at this game, this Kentucky team just outsizes West Virginia. Marv Albert: You know on television you cannot really see how tall these guys are. It’s unbelievable what a big team the Wildcats are. Devin Booker is dead on from outside. Kentucky shot over 60 percent from the field in the first half and finished at 48 percent, while holding West Virginia to an abysmal 24 percent. Big performances were delivered by the Harrison twins, Tres Lyles, Dakari Johnson, and perhaps most importantly, Devin Booker, who hit for 12 big points. The kitty kats are 37-0 with three to play. Next up is Notre Dame with a ticket to the Final Four on the line. Book it and bet it. Kentucky hasn’t lost a game since the NCAA championship game last year. UK is favored by 11 points over the Irish. In a money game my guess is the Cats will show up big to send a message to the winner of the Zona/Wisconsin game. Delusional individuals are trying to dredge up how Notre Dame stopped UCLA’s 88-game win streak back in 1974 by beating the Bruins 71-70. This is simple math again. Notre Dame starts one guy that is 6’10” or above, the rest are a pedestrian 6’6″ish. The Irish are gritty, well coached, and hard-nosed, so I expect them to not back down, and that will be their undoing. The Wildcats are going to feast on hurried shots and ill-advised drives down the lane. The Big Dance has now been turned into the University of Kentucky Invitational Tournament. Come play the Cats at your own risk. This entry was posted in Events, News and tagged Fighting Irish, Kentucky Wildcats, NCAA Championship, Notre Dame. Bookmark the permalink.